Condition is Pre-owned. SI LV ER T ON E LI ON H EA D. B ai l fo r ha ng in g on b ac k. Un iq ue. Ab ou t 25 y ea rs o ld. I ra re ly w or e! US s hi pm en t on ly. Pa y Pa l on ly ! US s hi pm en t on ly ! ELEPHANT PENDANT. G old Toned. Rarely worn. Pa y Pa l on ly. N ea t pi ec e. Ab ou t 30 y ea rs o ld. New ListingLion Tooth Pendant. Lion Products Are Legal To Sell. Lion Tooth Pendant. Lion Products Are Legal To Sell.. Condition is Pre-owned. Shipped with USPS First Class Package. eBay please don’t take this down. •Cuban Chain Necklace with Premium Plating. • High Quality Cuban Necklace. •14k Gold Plating Over Brass Makes It Bling Perfect. HIP-HOP JEWELRY. You never know what I will dig up in Western Pennsylvania! Style : Lion. Pendant (Approx.). : (H) 3.5 cm x (W) 2.3 cm. Chain Length (Approx.). Chain Width (Approx.). Rhinestone, Turtle, Frog, Monet, Fairy. CCI, Monet, Scitarelli, B.G.C. Lourdes. Hearts, Shell, Lion, Stone, Floral. Mens Stainless Steel Necklace Lion Head Pendant w Matching Gold Tone Chain 22"
Product Specification: Metal Stainless Steel Style Pendant Color Gold Weight 0.89oz(25g) Pendant Length 1.7"(4.4cm) Pendant Width 1.1"(2.9cm) Chain Length 22"(55cm) Chain Width 0.12"(1mm) Package Included: One Necklace One blue bag Features: . 5 out of 5 stars - Mens Stainless Steel Necklace Lion Head Pendant w Matching Gold Tone Chain 22"
7 product ratings7 product ratings - Mens Stainless Steel Necklace Lion Head Pendant w Matching Gold Tone Chain 22"
LION PEWTER PENDANT NECKLACE ! LION ( MARKED PEWTER ) PENDANT NECKLACE ! IT'S PRETTY NICE LOOKING , WOULD MAKE A CUTE GIFT FOR ANYBODY ! Item arrives with a small jewelry bag Condition :100% brand new Material: Stainless Steel& Fake Onyx Weight:about 109g Stainless Steel Jewelry does not tarnish and oxidize, which can last longer than other jewelries. It is able to endure a lot of wear and tear. And it is amazingly hypoallergenic. Such advantages make it a more popular accessory. Brand Unbranded Style Pendant Theme Animals & Insects Metal Stainless Steel Color Black Main Stone No Stone UPC Does not apply MPN Does not apply. INVENTORY#: FMY504. Made of Solid Sterling Silver. NOTE: IF THIS ITEM CONTAINS A GEMSTONE: WE ARE NOT AN EXPERT ON GEMSTONES, THE LABELING OF THESE GEMSTONES IS OUR BEST GUESS AND MAY NOT BE CORRECT. It is marked 14k on the back. The item pictured is the actual item that you buying. This is a coat of arms pendant on a necklace that is good size. See the first photo. 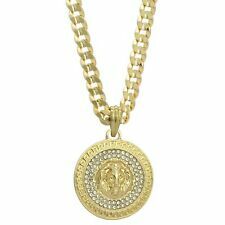 HIP HOP ICED OUT RAPPER STYLE LAB DIAMOND WHITE GOLD PLATED 3D JESUS FACE PENDANT. Hip Hop Celebrity Style Pendant. Lab Diamonds on pendant. WHITE GOLD PLATED. SIZE OF PENDANT : 55mm x 45mm. Canada: 1-2 weeks. 925 sterling silver Lion Pendant Necklace. Condition is Pre-owned. Shipped with USPS First Class Package. Made in Italy by UnoAErre of Arezzo. had previous owners and. Adorable Betseyjohnson lion head necklace. Hard to find. Measurements are in pictures with a ruler. Smoke-free home. Cz Lion w/ 30" Cuban Necklace. •Cuban Chain Necklace with Premium Plating. • High Quality Cuban Necklace. •Lion Pendant with Cz Stones. •14k Gold Plating Over Brass Makes It Bling Perfect. HIP-HOP JEWELRY. Look at the pictures closely to see the features of the coins. This picture represents the actual coins you will receive, although all coins vary slightly.These coins are in very good condition and totally readable with minor flaws.